Photos from Ria in Holland new! Mennorode was early this year, on march 8, 9 and 10th. It was a wonderful weekend. For the give away origami I used your gift box shaped envelop. Inside a piglet for Good Luck! Some lovely Christmas photos arrived from Ágnes Horváth, Hungary. I am so happy to see this charming Christmas tree with full of origami "Teddy Bear". Thank you so much, Ágnes. The Warli Tribe is one of the largest in India. Warli painting is a style of tribal art mostly created by the tribal people from the North Sahyadri Range outside Mumbai. Warli artists use their clay huts as the backdrop for their paintings, similar to how ancient people used cave walls as their canvases. These rudimentary wall paintings use a set of basic geometric shapes: a circle, a triangle and a square. These shapes are symbolic of different elements of nature. The circle represents the sun and the moon, while the triangle derives from mountains and pointed trees. In contrast, the square appears to be a human invention, indicating sacred enclosure or a piece of land. 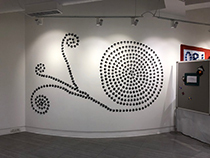 Here on this wall display of origami titled 'WARLIGAMI NINJA' Fumie Takahashi & Hitomi Ashta have created Warli art through origami by folding. 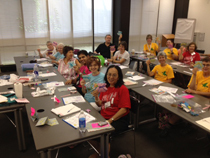 My Special Sessions origami class at the museum was a great success! 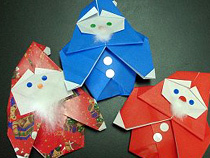 The students enjoyed folding and decorating your colorful and clever Christmas models. I have attached a few photos showing several of the students proudly holding their creations. Thank you for giving me permission to share your models with my large, happy group of folders today. Best wishes for a peaceful and happy holiday and a healthy new year! The 41st Japanese Festival was held at Misssouri Botanical Garden on Sep.1st~3rd. It is one of most popular Festival in St.Louis. I and 41 origami volunteers enjoyed origami with a lot of children. It was a fun event. Kids love your Fairy Penguin, Sitting dog, Owl bag so much. We used 2396 sheets of papers for 3 days. How pretty and what an exciting folding, dear Shoko! I always wonder how you can create completely new models. A crane shell from the basic folding of windmills, just amazing! You are a big origami creator, that’s sure. Tomorrow, 1st of August we celebrate national day in Switzerland. I will decorate our table with your lovely crane bowls. Many thanks for the beautiful model! Soon you will fly to Hungary for the Origami Convention. I wish you a lot of success and joy with the people in Hungary. I am sure they will adore you. 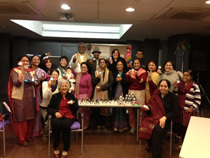 Look how happy the students who took my Special Sessions class, “From Shoko with Love”, are with their newly folded models. Some favorites were your Fairy Penguin, Sitting Dog, Gift Box Greeting Card, and the Little Red Riding Hood and Big Bad Wolf puppets. Brandon, a young friend of mine, is going to be ten years old on Friday. 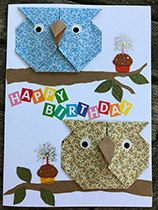 He absolutely loves owls so I decorated his birthday card with two of your cute owls. I think he is going to love the card! 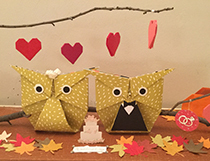 Shoko's OWL was introduced with the Adeline Klam's weblog. Dear Shoko We all say many many thanks to you for your lovely OWL BAG. We really enjoyed the folding!! Shoko,Your newest owl was quite popular at the ornament exchange held at the LIFE origami weekend at Stony Brook University. 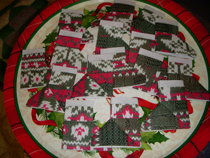 I had fun folding them from holiday themed paper. Everyone thought they were so cute and I agree! Last week we had another bridal shower in school. One of our Kindergarten teachers is getting married on October 30th. She absolutely loves OWLS! Your origami owls were perfect for the centerpiece I made. I folded them out of scrapbook paper. The bride owl had a sparkly veil and the groom owl wore a tuxedo complete with a tiny bow tie. They stood under a tree branch filled with twirling origami hearts. Pumpkins and colorful leaves helped create an autumn theme. Everyone remarked at how cute the Owls looked. The bride loved it! Every so often a model comes along that captures me; such is the way for Shoko Aoyagi's: Velveteen Rabbit. A little challenging at first, which I like, and then to decide on paper choice. This little bunny indeed is one of my very favourite models. Thank you to Shoko for sharing her diagram with me! I want to let you known that I am so happy to fold the models from your new book. 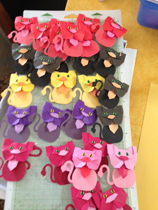 When I started with folding the animals, I could not stop!!! They are so cute, and there was an idea. Shoko’s Zoo. I hope you like it. Thank you for all the joy, you give us with your lovely models!!! Today we celebrated your Teddys "Happy Day in Switzerland"! We had a lot of joy and fun with folding the cute, little bear. As you see, your Teddy has now a few more friends and followers. Your Teddy is a wonderful model! Thank you so much that we are allowed to fold it. 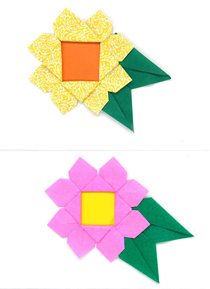 Linda taught us your wonderful Sunflower from your new book, Girls Origami. It is so simple and clever! I made it from small squares to use on a card. I love your Girls Origami book　(ISBN 978-4-415-31985-8) and enjoy your models very much. I still go on folding them. Thanks a lot. Best wishes, Richtje. 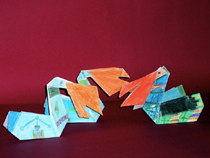 Richtje is the creator of "Dancing frog" origami model. I really like her dancing frog . So I introduce her model with my new book. 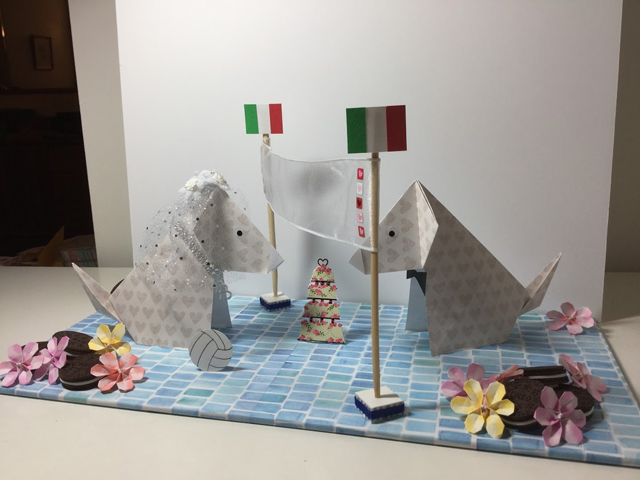 I was able use two of your original origami models in bridal shower centerpieces that I made for two teachers who work in my school. The first couple have two dogs so I folded and decorated a Sitting Dog bride and groom. Since the bride enjoys volleyball, I placed the dogs on either side of a heart-filled volleyball net. Oreos (the bride's favorite cookie), pastel colored flowers (to match the bridesmaids' bouquets), and the Italian flag (both bride and groom are Italian) completed the display. The second shower had a nautical/ocean theme. I transformed your Pelican model into a bride and groom. Each pelican was holding a red heart in its beak. I folded the pelicans out of 12-inch scrapbook paper and their cute faces brought smiles to everyone. A heart filled lighthouse, sailboats, and two life preservers holding a wedding cake and champagne completed the display. Thanks Shoko, for such wonderful models! Here is the adorable birthday greeting card made by Gay Merrill Gross. 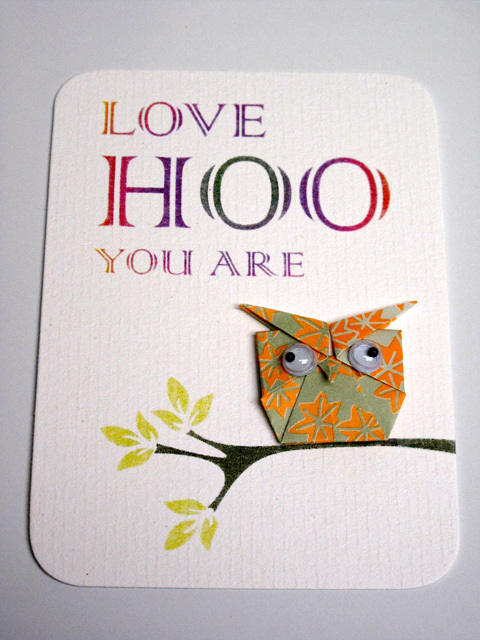 Gay used my creation ``Penguin chick`` for this card. Her way to make this card is so clever! Thank you very much, Gay. 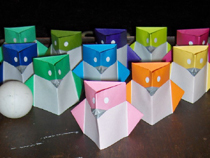 Penguin chick can be found in my book, Kawaii Doubutsu Origami, which was published on September 12, 2012. 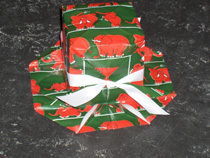 Hello Shoko, At the last folding evening in december in Heerhugowaard we made your box with flower. People like this model. I'll send you a picture. It is not a very nice foto, but I hope you can see the models. Some people made only the flower and used them at a postcard or a christmas-card. I hope you have nice Christmasholidays. So I wish you a pleasure oldyear happening. And for 2015 a happy folding year. We made our greetings cards this week-end! Shoko, the kids loved fold your Christmas tree card! Arigato Gozaimasu! (Les cartes de voeux sont faites! Les enfants se sont bien amusés! 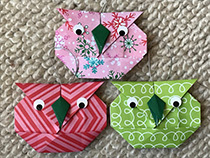 I had so much fun folding your owl for my ATC trade this year @ the NY Origami Convention. Photos from Taeko KANEKO in Japan new! 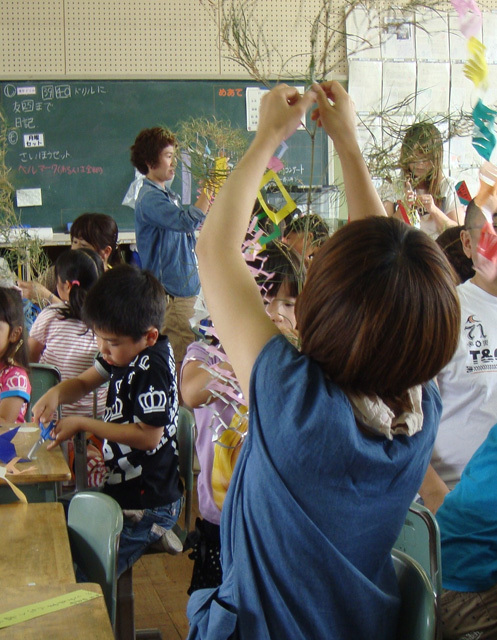 Taeko taught some star festival decorations for primary school students. She introduced "water melon origami" and they enjoyed writing their secret wishes inside of the water melon origami. Ms Chizuko is the member of the Ocarina group. Ocarina is a wind musical instrument — a type of vessel flute. 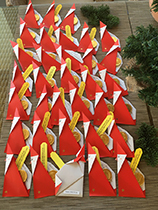 She regularly visits the nursing home to play Ocarina with her group and always gives some small gifts "origami", to 100 elderly people who lives in the nursing home. 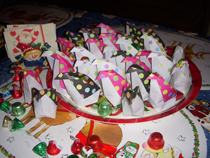 Chizuko made many "Fairy Penguins" this time and put them in the big boxes as a gift. 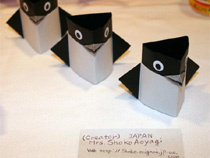 Fairy penguin that Chizuko folded made 100 people smile! So happy! 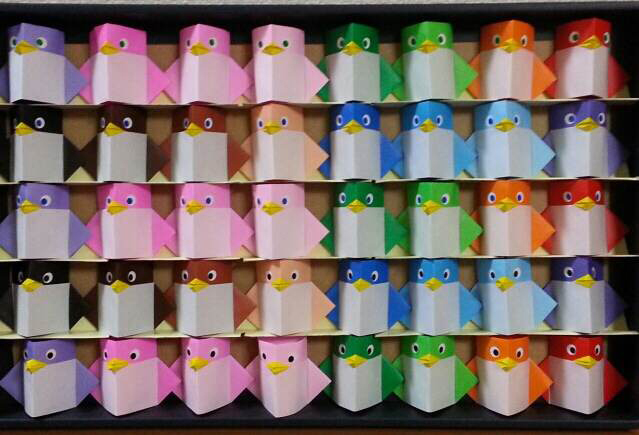 Thank you to fold many Fairy Penguins , Chizuko san! The teacher I work with is getting married in July. She loves dogs and recently adopted two black lab puppies from a shelter. Yesterday we had a surprise bridal shower for her. 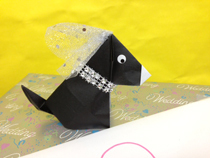 Since the theme of her wedding is "Black, White, and Bling", I folded 16 of your Sitting Dogs out of black and white scrapbook paper. The bride dogs wore rhinestone collars with silver heart charms and sparkly silver tuille veils. The groom dogs had handsome white bow ties and black ribbon collars. The wedding dogs were the talk of the shower. Everyone wanted to take a dog home, but the bride-to-be has decided to use the dogs as table decorations on her wedding day. The dogs are my favorite origami model. They are fun to fold and always make people smile! Thank you for sending me the directions for your wonderful Cat's Tongue fold! 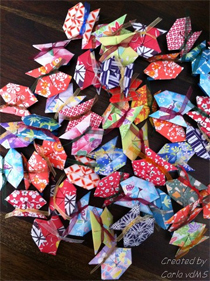 I made many of these for the Long Island Folding Enthusiasts Origami Heaven event last August. Everyone enjoyed them and I will send a few photos for you to see how they came out. I included some cat cookies with the pins as well for that all important snacking. It is a great fold all by itself, but for the pin I added a body (made with a punch that is actually a vase) and a tail that was cut by a Cricut machine. Thanks for all of your wonderful folds- hope to meet you one day in the future and thank you in person. 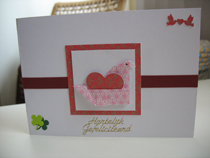 I want to show you this card, which I made with your model the Dove!!! Hopefully do you like it. Your lovely book　Kawaii Doubutsu Origami is a big inspiration for me. Thank you for giving me so much fun. Mizuyo made this lovely cat out of wrapping paper. You can insert the letter into its body. How lovely it is! 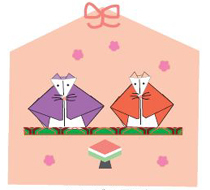 Kawaii Doubutsu Origami shows how to fold this cat. I look after the origami club at Yui/Heart Fukushikai that is the training institute for the handicapped people. 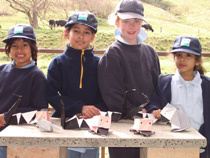 On Wednesday 15th of May we made Fairy Penguins and played with magnets. Placing the magnet inside of the Fairy Penguin and set another magnet close to it, the Penguin walks!! Everyone enjoy with them. Hope you had a good flight back to Japan. 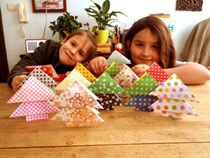 Did you enjoy the Origami-weekend at Mennorode? See any other Dutch sightseeing things or did you go straight back on Monday? You were very busy all the time with teaching all the ladies that wanted to know how you fold your wonderful items. Loved the bears on the chair, a pity I could not get a place at your table for these, but I have your book so I can do the bear myself. And I totally forgot to let someone take a photo of you and me...but who knows... perhaps in the future :o) I have put a photo of your treasure bag fold in this mail, see below. Folded them for the members/attendees that were at the convention, to put on their keycord. The only thing I did not do was folding in the little point on the top of the treasure bag, no good for my fingers! And thank you again for bringing me your origami book. Have a nice weekend. Photos from Marianne in Switzerland! Already for many years I visit your wonderful Origami homepage. Your models to the proverbs are so attractive and surprising. You have already inspired me many times to new one. I thank you so much. 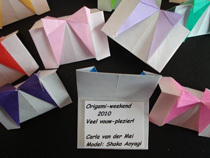 On Origami Convention in Mennorode/Nederland 2013, I had the great chance to meet you. I was so happy! By this occasion I showed you the photo of the cake to the baptism of our grandson Nils. You asked me to put the picture in the gallery. With pleasure! Maybe the inspiration goes on!? 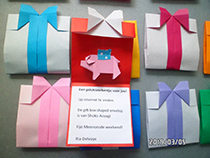 Thanks a lot, dear Shoko for your generosity for sharing your charming origami models. Today (Jan.16th) Oritai members enjoyed Shoko's 'Fairy Penguin'. Sandhya, one of the executives taught this item with some songs. It was like 'Storigami'!! Oritai members are from 3 to 85 years old and from various walks of life. Thank you, Shoko!! We miss you!! Merry Christmas to you and your family! Our family and relative's Christmas party for this year, I gave out to all 30 adults and 2 little girls one of your masterpiece, "Toddling Penguins" as a party favor. Everyone loved it !! The girls were so happy and took few to share with their friends. Thank you Shoko for sharing your wonderful model. 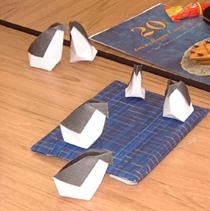 Hisako introduced children "Traditional Origami Helmet" in her Academic Origami class. She gave them "Christmas Stocking with 3 Pockets" which Shoko Aoyagi created. They loved the gifts. What a great idea Hisako used nice printed paper! The 11th Autumn Festival was held at the aquarium in Long Beach. 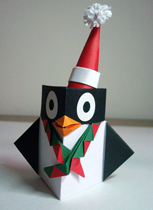 I introduced "Fairy Penguin" ORIGAMI. We all enjoyed it and had a great time! 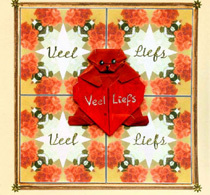 As promised I made a card for you with a model from your new book "Cute Animal Origami" .かわいいどうぶつおりがみ In The Netherlands Autumn has begun. So I made a card in that atmosphere. HI Shoko! 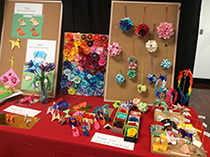 I just wanted to tell you that the card class at Origami Heaven 2012's Long Island Fold Fest (Stony Brook, NY) went really well! They loved your Treasure Bag! First we folded it out of 12" colorful scrapbook paper and wrapped "raffia" around the waist of the bag. We all felt it would make a lovely card on its own. 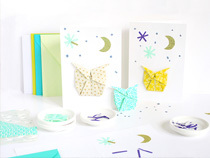 Then we moved on to make the card embellished with your small Treasure Bag. I cut 6" chiyogami paper into five inch squares and they used the leftover piece to make a band for the Treasure Bag. 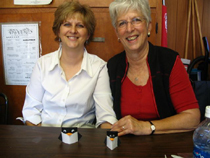 Each class member had a kit that my co-teacher Barbara Syrett and I prepared ahead of time. 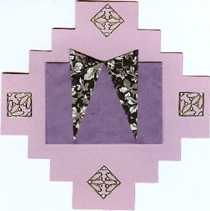 The kit included the cardstock for the card, embellishments and your much-appreciated directions. 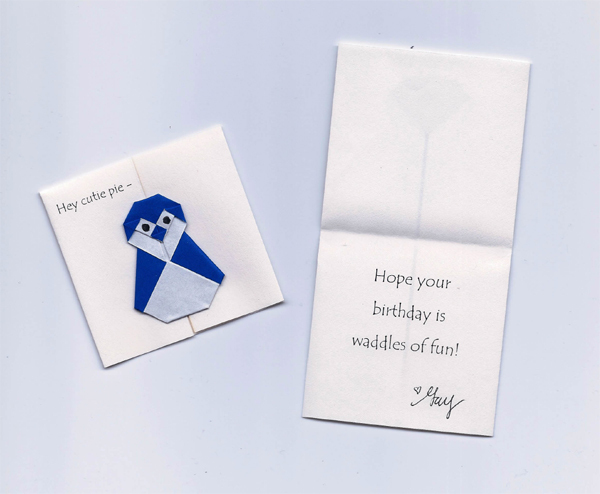 We even made an envelope for the card using the Scor-Pal (a great scoring tool) with a plastic 45 degree triangle. I have more photos to send and.you may see some familiar faces! They all did a beautiful job and we all had a lot of fun too. Best wishes and thank you again for sending directions for such a useful and charming fold! 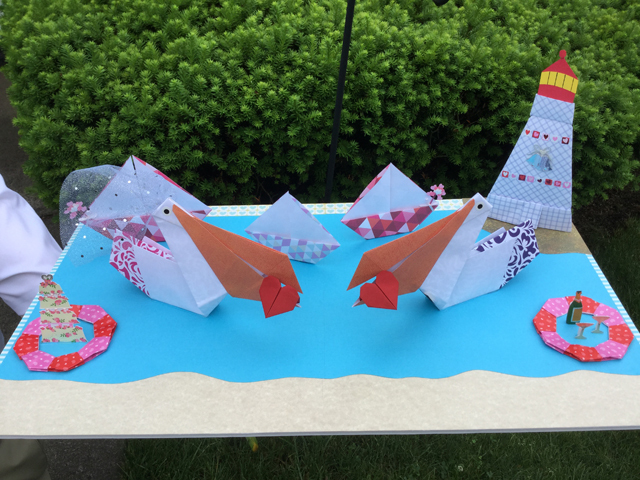 Perhaps you will attend Origami Heaven one day - it's a special event! Aoyagi sensei, I am a student of Hitomi sensei in India. I would like to send you a picture of penguins that we made during our class. This models are folded for my friends Carolina Zafra and Innavoig Otneimras Orelav. 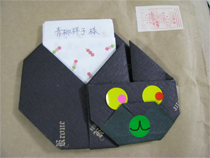 Mrs. Kaneko introduced how to fold origami puppet ( see origami archive 's Wombat diagrams) for grade 1 and 2 students at primary school. 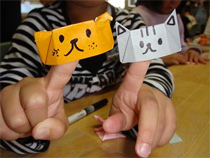 10 cm x10cm origami paper is just right size for their fingers. 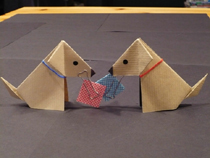 Once they remember how to fold the basic puppet (wombat), they can easily make other animals, such as piggy, doggy or cat with changing the ear's folding. They enjoyed folding and drawing the faces on them so much. Thank you for sharing the diagrams. Recently I taught four lovely young ladies how to fold your Sitting Dog. 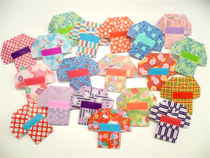 We used 12-inch squares of colorfully patterned scrapbook paper and added ribbon collars. 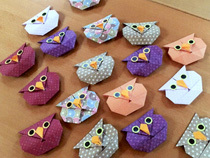 Mrs Watanabe introduced Origami as one of art therapies for everyone in Shizuoka prefecture. She introduced Shoko's Cat and the chair for her classes. Kyoko, a Yogo teacher (school nurse) and the students spent one week at Exploris Middle School in USA this summer. She talked about 'Sadako and one thousand of paper cranes story' and then she introduced how to fold a paper crane to EMS students. She also introduced how to fold 'Sitting Dog' to them. The sitting dog looks like the mascot of EMS, Bristol. So it was so popular. Here is the photo. Cute isn't it! Thank you so much for sharing your model. 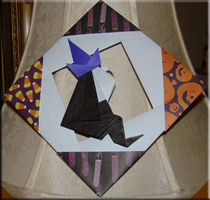 Attached here is my origami decoration for Halloween. 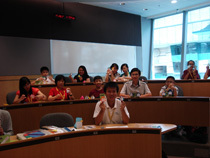 I taught your Fairy Penguin to local Singapore students at 5OSME Plus Singapore. Everyone was very happy! See photo. I like Deb's report of 2009 Origami Holiday Tree at Kona Airport with issue 103 the PAPER the magazine of Origami USA. Absolutely wonderful! To view all the photos, please click here. Mrs Hirai is the leader of the science group 'Cosmo' in Tokyo, Japan that she established 22 years ago. 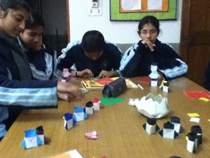 The aim of the group is to enrich kids' mind through the science activities. 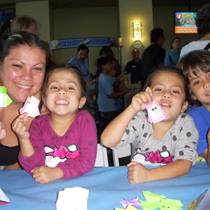 Every Saturday, kids learn science with books and activities from Mrs. Hirai. Last Saturday, she talked about the feature of penguin with kids and then she introduced how to make origami 'Fairy Penguin'. Kids made their penguins and enjoyed so much. 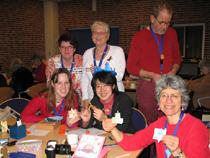 Two weeks ago we had our yearly Origami-weekend here in the Netherlands. Since Linda Bogan showed your models 2 years ago I really like them. Every year we get a keychain and it has become an yearly thing to fold something that can be worn on the keychain. This year I folded 50 of your little gift boxes for swapping with the other members. Also made this card with your crane on it. Our town had a Green Day in the park. There were displays about recycling, saving energy, reducing waste, and other ways to help the Earth. 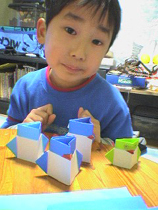 I taught origami using recycled paper instead of kami. I cut squares from the brown paper bags our Whole Foods Supermarket uses to pack groceries in.Your Australian Butterfly and Sitting Dog were two of the most popular models that day. Hiroko, a waitress at our favorite Japanese restaurant, graduated from college. She was an English Literature major who loved Shakespeare. So your clever Shakespeare model was a perfect decoration for the front of a card I made for her. When I was asked to teach a summer-themed workshop at a local library, I chose your easy watermelon model. See how happy the boys and girls are as they hold up their colorful slices. Thank you for sharing your wonderful origami models! Hello, Today I conducted a workshop for a few children and their mothers. We folded the 'Easy-Peasy Heart' among other models.I'm sending a photo of us holding up the finished model. The group enjoyed folding the heart. Thank you for sharing your work. Hello Shoko, I could not go to the weekend in Hungary last year. But I was in Hungary in May and I have tought the teeter totter to Ildiko. So she introduced the teeter totter on the origami weekend. I have found your Christmas tree with box in the magazine from Hungary and I like to use this tree this year in my Christmas origami workshops at home. It is a very nice tree. *Click photo to view slideshow. Wies is fond of my Lucky Elephant. She has several cards with the model. She sent one of them. Isn't it beautiful! Your Unit Bunny was part of my table centerpiece. For the chicks I folded your Fairy Penguin in yellow paper and added an orange beak. OSN 25th Anniversary Convention at Mennorode, The Netherlands, April 2008. The pictures show an overview and some close-ups of my popular display featuring many of your delightful models. My niece and her fiance are great dog lovers. For their wedding I folded over 70 of your Sitting Dogs. They were used as place cards at the wedding reception. I used 12" squares of scrapbook paper in tones of pink and brown to match their theme. Pink and white polka dot ribbon bows adorned the dogs' necks. The dogs looked adorable, were quite unique, and received many complements! This photo will be included with the information paper of Owariasahi city issued on the 1st of July 2008. Last year I sent you two cards with the "lucky elephant" Because I like this model very much, I made two other cards with it and a card with the bear with heart I would like to share the results. Rob Curry is the new Outreach Co-ordinator for a project called SERPENT at the National Oceanography Centre in the UK, which uses commercial ROVs to take pictures of deep-sea creatures, some which have never been seen before. His job is to educate school children and the public about what his project does. Rob reported of the activity with the traditional fish instruction from my website on Saturday 15 of March 2008. Thank you for the report, Rob. Thought you'd like to know that the event on Saturday went very well, and guess what the most popular activity was? - yes, your fish! I printed three copies of the instructions to use on the day, but people took them all, so I was left to show each child how to do it (actually meant that I was a one-man production line for fish!). On Sunday 2nd of March 2008 Mrs Hayashi led the Hina doll Origami workshop at Doudan-Tei,- Owariasahi City, Aich Pref. Japan. She introduced visitors how to fold the Mouse Hina dolls wearing Kimono, which is created by Shoko Aoyagi. 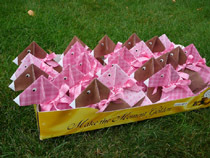 About 60 people enjoyed folding Mouse Hina dolls. Thank you for the photos, Mrs. Hayashi. 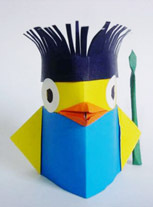 'Teeter-Totter Penguin' created by Shoko Aoyagi in 2005. You can put some sweets in the Teeter-Totter's back. 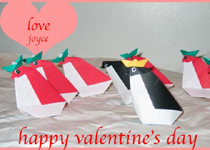 I took my photo of the penguins dressed for Christmas and made them into a　Valentine's card. it was very successful thanks to the excellence of your model. my best to you as always. Hi! 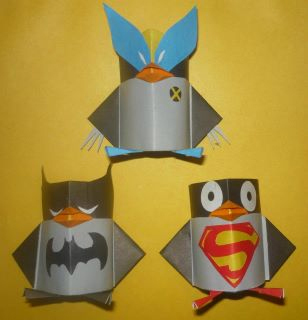 I was first introduced to your work at the Origami convention when everyone was making the adorable penguin. What a special fold. I was then taught the dog by Tricia Tait and when my friend's dog Rocco died, I sent her this "condolence card." Thank you for so many wonderful folds-- one day I hope to make the adorable "Chicken Soup" card -- you have such great ideas! Thank you again. Hope some day you can come to the OrigamiUSA June Convention. 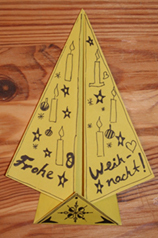 The Christmas tree card refers to the "Christmas Origami with Shoko" book. Hello Shoko, I made a "Christmas tree" with a design of you. 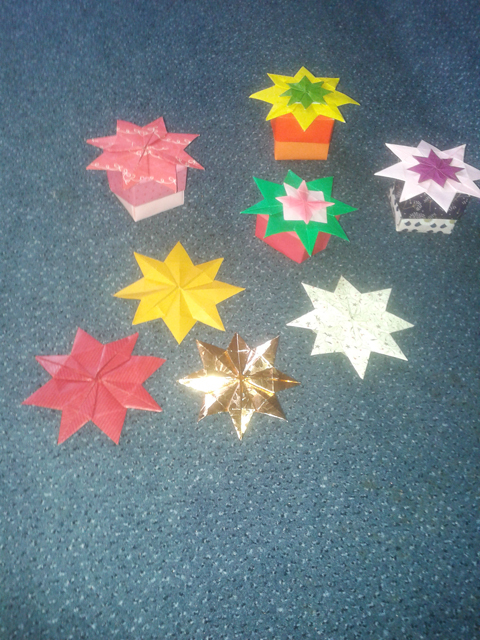 I thought it last week on a meeting about " Didactic and methodic of origami especially about Origami and Math/Geometrie. Now I thought, that your design is fine for every one to make a "original personal design of a Christmas tree". So I give a short explanation to fold the tree on my phototream at flickr. You can see more on Flickr and "gerd2007"... I wish you nice days and all the best for the rest of the year and for the coming next year! Shoko, I thought you would not mind if I taught the penguin twice. 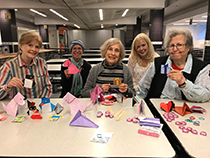 These pictures are when I taught your model along with some others for World Origami day at a rubberstamp store, Reinbeck. I am back from PCOC where I took pictures also. I downloaded them to my new laptop to make room in my camera for more pictures. Now I can't find them on the computer. When my son visits again I will ask him to help. I can't imagine what I did wrong. I not only lost pictures of the class but step by step directions of classes I took along with some wonderful origami from the Master's exhibit. If I find them in my computer I will send them to you. Also I am going to make a request to the O-list to see if anyone else has some. Pictures were take but I do not know if they are on any lists. Thank you for your permission. We did them out of 10 inch paper and they went very fast. It was great to meet a lot of friends at the BOS convention - and do nothing but folding for a weekend. As I promised you, I taught one of your model, the Lucky elephant, to people whom maybe you know. David Lister is the living bibliography of origami history: he knows about the origami's past more than other can imagine. John Cunliffe was one of the founders of the BOS, and i taught the elephant to him, when we met in russel Hotel, on a memorial day, whenre the forst meetings were held 40 years ago. 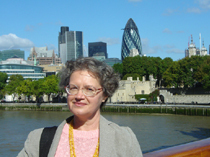 Joan Homewood is the president of BOS, she liked your model very much. 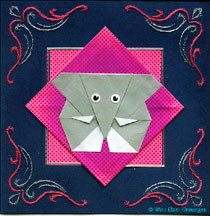 Marieke came from holland, and she enjoyed the lucky elephat - promised to teach to everyone. She said she knows your models, and your penguine is her favourite. Charlotte Pfeiffer came from Switzerland - we were room-mates. We folded several elephants together. At the dinner I went to the other tables and give elephants to people who were in friendship with Alain Georgeot (he is ill, could not come to the convention9 and they wrote messages on the elephants. So your models will reach Alain Georgeot in France - with the friendly messages. Hope you will enjoy the photos! I had three sunny days in London after the convention, with my son. He took the photo of me on the Tower Bridge. Hello Shoko, Thank you for your wonderfull diagrams. I am very fond of making cards. 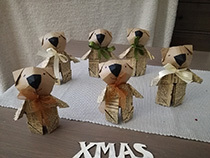 Making them with origami is one of the techniques I use. I just made two cards with your lucky elephant and thought you might like to see what they look like. So I take the opportunity to send them to you and hope you like them. Here are some photos from the Hungarian convention in Pecs. They show: the model menu (choose which picture you like best), some dogs lined up on the windowsill of the classroom I taught in, an assortment of butterflies I made into pins and handed out to the students in my class and other folders at the convention, and some pictures of my class with their Australian butterflies and Sitting Dogs. Everyone loved both models! 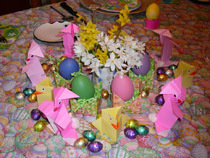 They were cute, colorful, and fun to fold. Look at the beautiful Christmas tree! With a picture of the christmas tree in our school entrance hall (do you see the origami trees and stars from your book?- made by tmy classes 3 and 4..... ) , i will send to you my best wishes for christmas and a happy new year!
" I enjoyed being greeted by penguins at my visit to the NOA museum!" Thank you again for using your diagrams. The people did love it. 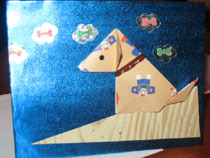 The first three photo's are from my origamiday St. Pli. The last three from the children in Hungary. He cleverly made the colourful penguines. He joined the workshop at Across Fukuoka (Japan) in April. Ryota said "I enjoyed the workshop very much!" here are the newest photos from the pelican, made by the kids of the second class (age about 9 to 10 years old). 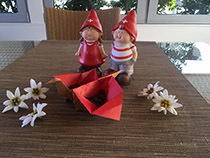 Greetings to you from all of us to you - we have now the end of wintertime - the springtime begins and the snow smelt away...and the SUN is shining! The computer teacher in school has graciously helped me scan and send these photos to you. I hope you can see how wonderful your models were and how beautiful they looked on my display. Also see how happy the women looked while they were folding your models. I hope you enjoyed your trip. I just received my NOA magazine yesterday and saw your new models in it. I am looking forward to folding them on the weekend. 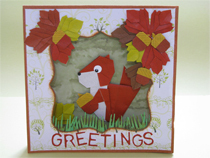 Yasuko sent a beautiful piece of work! She referred to 'Bear with Heart' and 'Hearty Bird'. 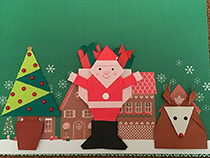 She made Santa and card (from 'Christmas Origami with Shoko') with her friend's grand-daughter. 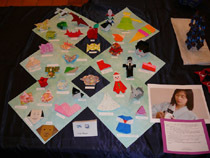 Sept. 30 to Oct 2, 2005... Phoenix, AZ -- -- PCOC - Pacific Coast Origami Conf. - To be held at the Sheraton/Starwood Four Points Hotel in Phoenix, AZ. Please visit the website at http://www.ifold.org.